Most young children love vigorous physical activity, but research shows that they may not continue to be active throughout childhood and beyond if they lack a foundation of skills. Early childhood educators need to ensure children's learning of the physical skills as well as movement concepts necessary to start them toward active and healthy lives. This book provides guidance on what high-quality movement programs should include: environments designed for young children, effective curriculum components, developmental approaches to teaching, planned assessment, and more. 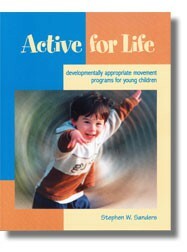 Unlocking childrens movement potential will inspire a love of physical activity for years to come.